A busy day and a headache, so a brief turn with some dancing fairies from Wirt Sikes and Elias Owen for #NationalDanceDay. That the Coblynau sometimes wandered far from home, the same chronicler [The Rev. Edmund Jones of the Tranch] testifies; but on these occasions they were taking a holiday. Egbert Williams, ‘a pious young gentleman of Denbighshire, then at school,’ was one day playing in a field called Cae Caled, in the parish of Bodfari, with three girls, one of whom was his sister. Near the stile beyond Lanelwyd House they saw a company of fifteen or sixteen coblynau engaged in dancing madly. They were in the middle of the field, about seventy yards from the spectators, and they danced something after the manner of Morris-dancers, but with a wildness and swiftness in their motions. They were clothed in red like British soldiers, and wore red handkerchiefs spotted with yellow wound round their heads. And a strange circumstance about them was that although they were almost as big as ordinary men, yet they had unmistakably the appearance of dwarfs, and one could call them nothing but dwarfs. Presently one of them left the company and ran towards the group near the stile, who were direfully scared thereby, and scrambled in great fright to go over the stile. Barbara Jones got over first, then her sister, and as Egbert Williams was helping his sister over they saw the coblyn close upon them, and barely got over when his hairy hand was laid on the stile. He stood leaning on it, gazing after them as they ran, with a grim copper-coloured countenance and a fierce look. The young people ran to Lanelwyd House and called the elders out, but though they hurried quickly to the field the dwarfs had already disappeared. It may be stated that Mr. Wirt Sikes, in his British Goblins, refers to the Dwarfs of Cae Caled, Bodfari, as Knockers, but he was not justified, as will be seen from the extract, in thus describing them. For the sake of reference the incident shall be called–The Elf Dancers of Cae Caled. “I am now going to relate a circumstance in this young period of my life which probably will excite an alternate smile and thoughtful reflection, as it has often done in myself, however singular the fact and strong the evidence of its authenticity, and, though I have often in mature age called to my mind the principles of religion and philosophy to account for it, I am forced to class it among my unknowables. And yet I may say that not only the fact itself, but also the consideration of its being to my own mind inexplicable, has afforded some useful reflections, with which this relation need not be accompanied. My friend, Mr. R. Prys Jones, B.A., kindly informs me that he has several intelligent boys in his school, the Boys’ Board School, Denbigh, from Bodfari, and to them he read the preceding story, but not one of them had ever heard of it. It is singular that the story should have died so soon in the neighbourhood that gave it birth. Edward Williams says they were more like dwarfs than children. Sikes writes: “they were almost as big as ordinary men, yet…had…the appearance of dwarfs.” Does this suggest that these were actual Morris dancers, stuffed or padded or otherwise guised in a grotesque manner? 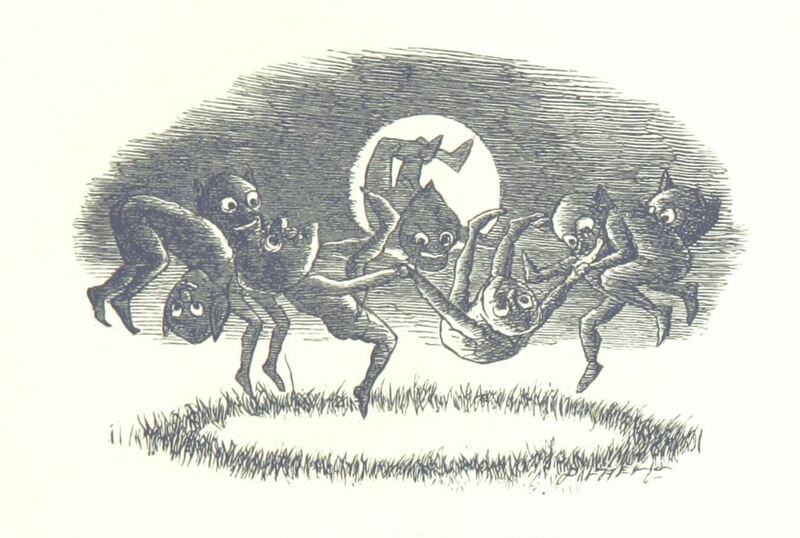 Or, as if the horrors of the fairy ring were not bad enough, had the Gentry taken up Morris dancing? Sorry, I have to disagree with you about the Morris dancers. From the first moment I saw Morris dancing, I was instantly sure that it was an old combat art cleverly disguised as dancing so that local people could continue to practice with weapons after having been defeated in war. I used to train in capoeirha, which is a Brazilian and Angolan martial art developed by slaves, where kicks and other combat moves are cleverly disguised as dancing. I had never seen Morris dancing when I learned capoeirha, but after practicing combat that has to look like a dance, when I did see Morris dancing, I could instantly tell it is the same thing. I also went to a folk festival where some Mexican American performers were doing a dance with machetes (yes!!! machetes), and although I don’t know what their dance was called, I believe it’s another instance of the same thing. The moral of the story: If you have been invaded and defeated, but you want to keep in trim and teach your kids to use weapons, then dress up in colorful costumes and play music, and tell everyone it’s a dance. Personally, I love watching Morris dancing on You Tube, and I really admire what they do. I’m glad that people in England took it up and didn’t let it completely die out.